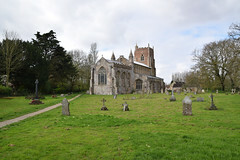 It had been twelve full years since I'd last visited Walpole St Andrew, and as I cycled down the dog-legging lanes from Terrington St Clement on a bright day shortly before Easter 2017 I wondered what to expect. The entwined villages of Walpole St Andrew and Walpole St Peter lie together on the edge of the marshland, looking across the Nene towards the Cambridgeshire fens more than to the rest of Norfolk really. The two church towers rise out of a sea of scrubby suburban estates, although you don't see them until you are almost upon them. It is St Peter that attracts tourists, especially with its annual flower fesatival in May, but in almost any other village in northern Europe St Andrew would also be well known, and would also be a draw for visitors. However, as it sits barely a mile from one of the grandest and most important churches in England, we can be forgiven for not thinking to beat a path to it. As it is, we would think this a big church if it were not for its neighbour, and St Andrew can beat St Peter in being wholly Perpendicular, a purer, later Perpendicular that is a result of the mid-15th century and a couple of crisp late 19th/early 20th century restorations. There are aisles, there is a clerestory. The rood turret spires and sanctus bell turret echo its neighbour. 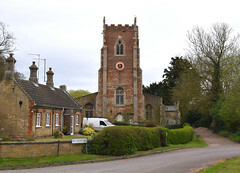 The gorgeous red-brick and stone tower has a little room built into the south-western buttress, which may have been a roadside shrine. There is another little door set in the south of the tower. It all sounds lovely, but when I'd visited in 2005 I found that St Andrew had fallen on hard times. 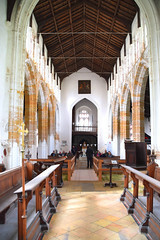 It had been declared redundant and placed in the care of the Churches Conservation Trust. The congregation had decamped to St Peter, and St Andrew now had the authentic CCT feel, cleared of clutter, the interior seemly, if a bit grubby. The most striking feature of the interior was that the stone of the arcades, chancel step and pulpit base was heavily eroded. 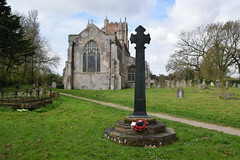 This is not unique; you will find it in several other churches, including a few in Norfolk, but St Andrew is probably the most famous example. 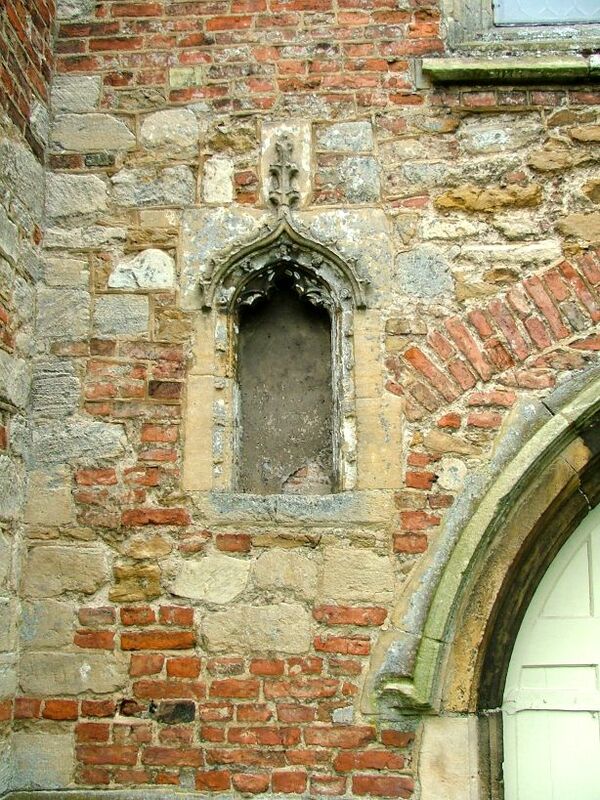 An architect's report pointed to rising damp as the cause, but of course all medieval churches have rising damp. 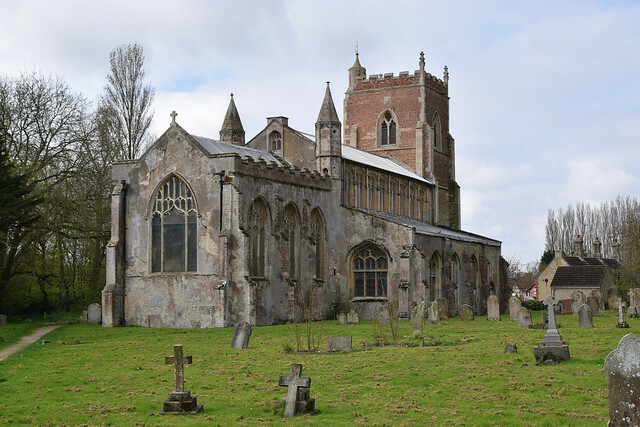 Probably, it is the result of a combination of the nature of the stone, the damp, and exposure to salt in the air - probably, the church spent years roofless. My other main memory was of how difficult the keyholder had been, insisting I return the key within ten minutes, and that there had been no less than five locks on the door. I thought this was overdoing it a bit. After all, there is very little inside that would be stealable, so I couldnt see the point in having even one lock, let alone five. When I wrote about this, however, I received a rather snooty e-mail from someone in the Churches Conservation Trust putting me in my place. Among other things, it told me that this is the most heavily vandalised of all their properties, which perhaps tells you a lot of what you need to know about this part of Norfolk. Approaching from the north-west, the church looked lovely in its open graveyard, although the dilapidation of the exterior rendering seemed to warn of what might be inside. However, the church was open, and there were CCT banners outside, hooray! But when I stepped inside it was to discover that a public meeting had just begun. 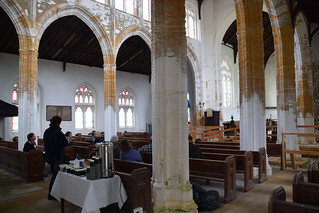 The lead from the south aisle roof had recently been stolen (so much for the locks), and some representatives from the CCT were explaining to a group of villagers quite how much work needed to be done. 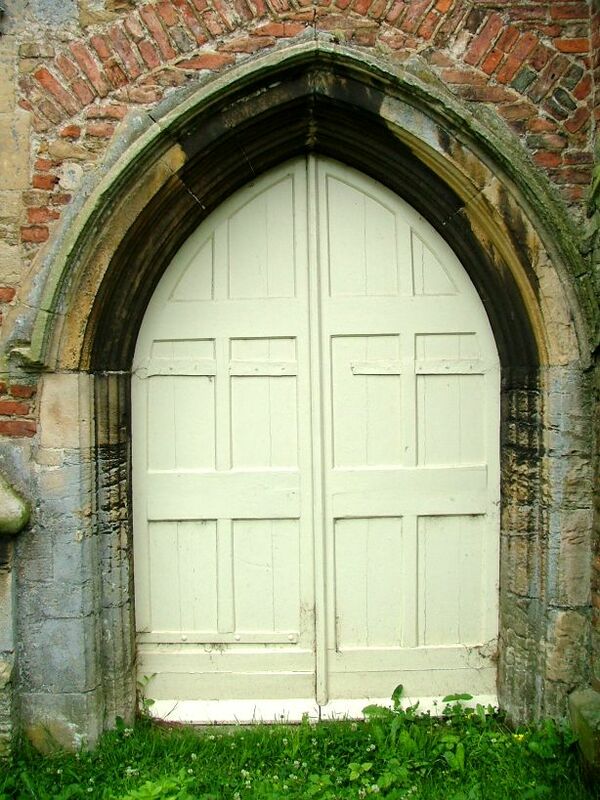 Beyond them, I could see that the church was in a dreadful state, far worse than in 2005. 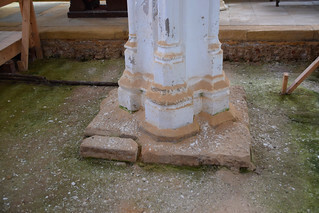 The floor has gone completely at the east end of both arcades, and the bases of the pillars are cordoned off and exposed. As I wandered around I could hear the village being presented with an ultimatum, more or less - either you help raise money to save this church, or you're going to lose it to being a ruin. This has always been a difficult one for the CCT, and it looks like remaining so. 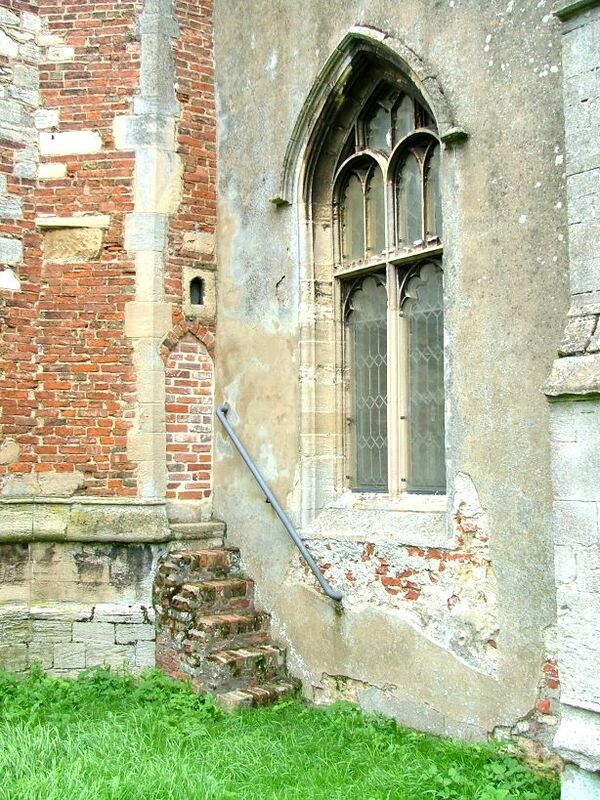 If you ignore the distraction of the erosion, decay and impending dereliction, you find inside St Andrew the elements of a typical East Anglian village church - indeed, it could be used as a teaching example. The 15th century font has quatrefoils and shields, the pulpit is 17th century with a preacher's hourglass, the west gallery survives, there are even some rustic benches. There are some curious alcoves which may be associated with a shrine in the nave. The stained glass is good of its kind. 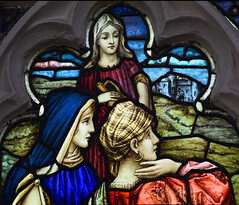 In the south aisle, a late Heaton, Butler & Bayne window depicts the three Marys meeting the angel at the empty tomb in a pleasing Arts & Crafts style. The east window is more interesting, the work of Arthur Moore who was parish priest of neighbouring Walpole St Peter. 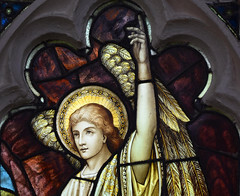 A highly skilled amateur glass designer and maker, there are a number of his windows in Ely cathedral. This window depicts the crucifixion, and one cannot help notice the banner along the bottom which reads IT IS FINISHED, which may serve as a warning to the parish. Heavens knows what will happen to this church. I won't leave it twelve years this time before I go back and find out.